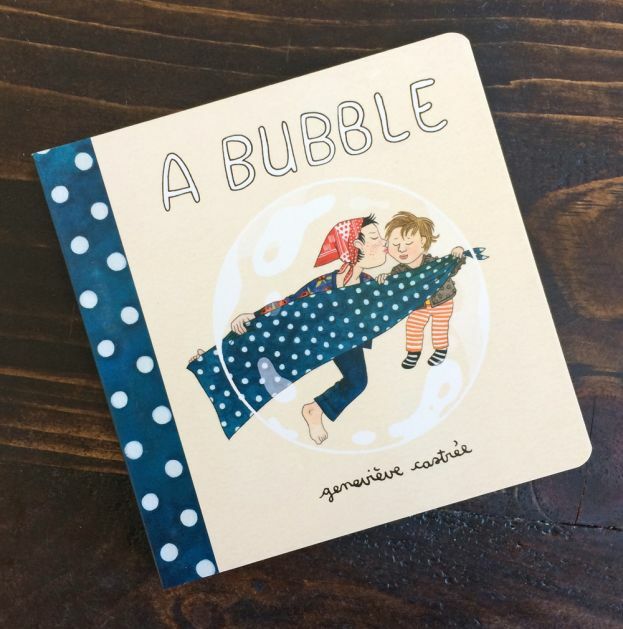 I wish I was intellectual enough, philosophical enough, cerebral enough to write a review of A Bubble by Genviève Castrée that reflected upon the meaning of life and loss, the power of artistic creation and the profound experience of parenthood. Instead, I find myself quietly sobbing as I read what others have written about this unforgettable book and try to write my own review. 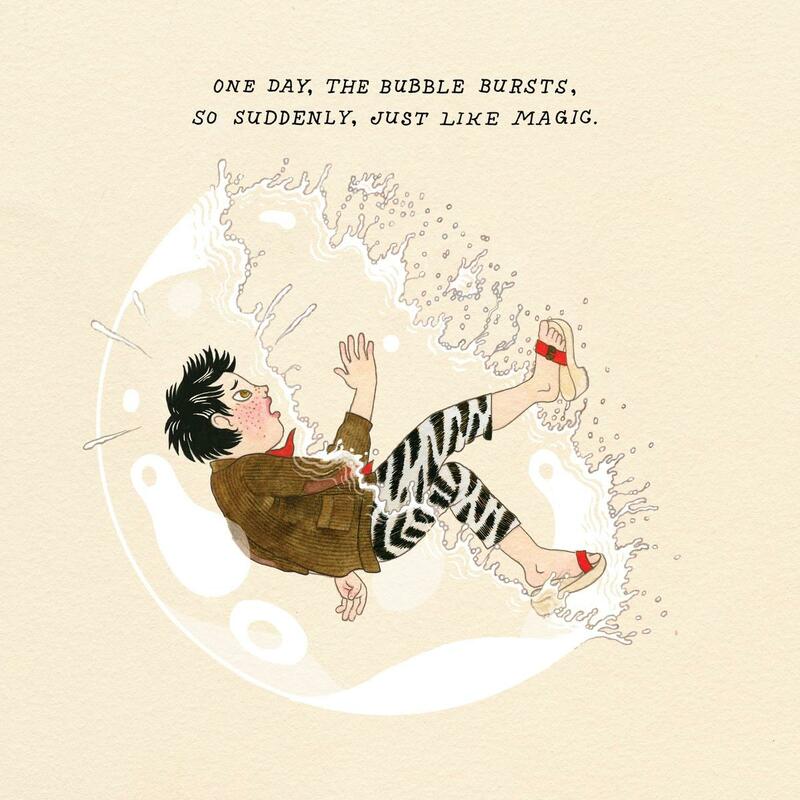 A Bubble is narrated by a little girl who, while unnamed in the story, is lovingly referred to as Pinecone, Chouette (Owl) and My Little Mushroom throughout the book. The narrator tells us that Maman lives in a bubble and she no longer remembers a time when she didn't. She is often invited into the bubble with Maman, who doesn't mind crumbs. Sometimes they nap together in the bubble, other times Maman works in the bubble and is very focused. Because of the bubble, Maman can't have adventures, but the narrator returns to tell her everything. It brings Maman great joy when the narrator draws with her inside the bubble. One day, magically, the bubble breaks and Maman, "kisses me a thousand times without even catching her breath." A Bubble ends with mother and daughter heading off the page, hand in hand, to get ice cream. 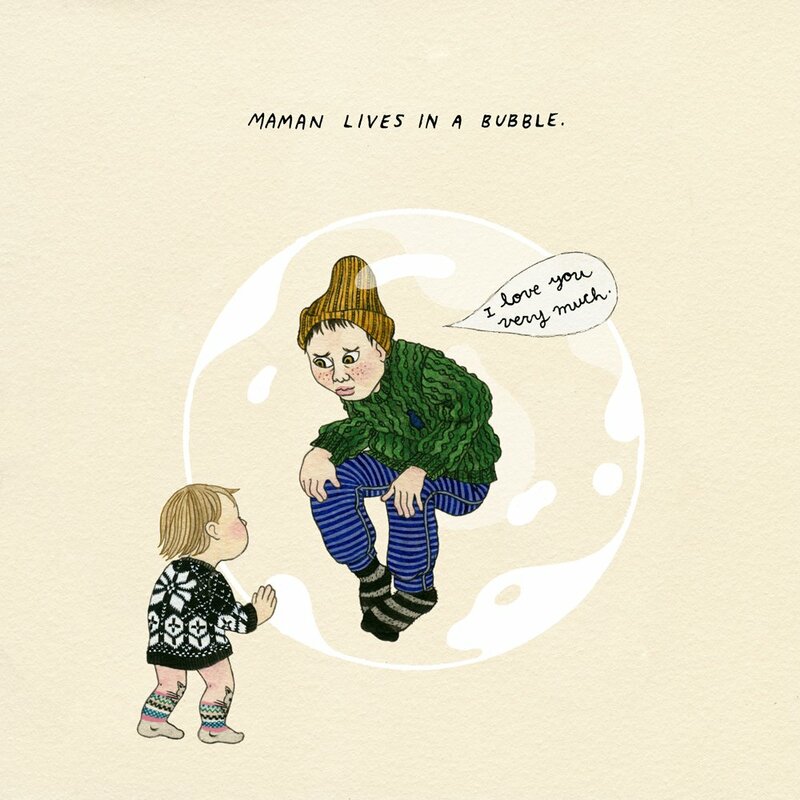 As A Bubble unfolds, it becomes unmistakably clear that Maman is sick, the cord to her oxygen tank winding through an illustration in the middle the book. The bubble is a metaphor for the disease that has demanded her isolation, a space in which Maman can be with her daughter, but also a space that keeps her apart from her daughter. A note at the end of the book tells readers that, "In her final weeks alive, Genviève clung to finishing this book for our daughter with intense focus and devotion. I think she was trying to cast a spell, to draw herself into survival. She didn't get to finish." As heartbreaking as A Bubble is to read, it is equally breathtaking to hold this book in your hands, to know that this act of creation and devotion kept the author fighting for life while also leaving behind a memory, a gift, for her daughter. And for all of us. Québécois illustrator, writer and musician Genviève Castrée was diagnosed with pancreatic cancer four months after giving birth to her daughter with musician Phil Elverum in 2015. She died in 2016, thirteen months after her diagnosis. A Bubble is a deeply intimate and emotionally powerful work of art that connects you to another person and makes it possible to feel what she is feeling. Reading and then sitting with A Bubble, there is no way you can deny the power of artistic creation to connect us and show us what it means to be alive, to be human. You can learn more about Genviève Castrée, her books, and her music (she performed as Ô PAON and Woelv) here. You can learn more about Phil Elverum, who performs as Mount Eerie, here.